Acrocanthosaurus was a common carnivorous (meat-eating) dinosaur in North America during the mid Cretaceous period, between approximately 125 and 100 million years ago. It lived in North America - fossils of the animal have been mainly found in the US states of Oklahoma and Texas, but fossilized teeth have been found as far East as Maryland. Acrocanthosaurus was up to 40 feet (12 meters) long, and weighed approximately 2.4 tons. One usual feature of Acrocanthosaurus is the large neural spines on the vertebrae of the neck, back, hips and upper tail. It is not thought that it had a sail on its back like Spinosaurus (which was unrelated, and had much larger neural spines), but rather it is thought the spines had attachments for powerful muscles, similar to those found in modern bison. Its not entirely clear what the purpose of these spines and muscles were - possibilities include fat storage, communication, or temperature regulation. North American Dinosaurs - Acrocanthosaurus lived in North America. Its fossils have mainly been found in the US states of Oklahoma and Texas, but fossilized teeth have been found as far East as Maryland. Acrocanthosaurus was a genus of dinosaur. "Acrocanthosaurus" means "high-spined lizard" (referring to the neural spines on its vertebrae). Acrocanthosaurus was a member of the Saurischia ("lizard-hipped") order of dinosaurs. What this means, is that although Acrocanthosaurus was not closely related to lizards, it did have similarly shaped pelvic bones. Acrocanthosaurus was a Theropod - a member of a group of related bipedal dinosaurs that included the ancestors of birds (although Acrocanthosaurus was not itself an ancestor of birds). Acrocanthosaurus lived between about 125 million years ago and 100 million years ago, during the Cretaceous period. Acrocanthosaurus was a carnivore (meat-eater). Acrocanthosaurus was about 40 feet (12 meters) long. Acrocanthosaurus weighed about 2.4 tons. How can paleontologists know what a living dinosaur was like more than a hundred million years ago, particularly when only partial skeletons remain? Focusing on one large carnivorous dinosaur, Acrocanthosaurus (“high-spined lizard”), paleontologist Kenneth Carpenter explains the process, pairing scholarly findings with more than 75 color illustrations to reconstruct “Acro” before readers’ eyes. In Acrocanthosaurus Inside and Out, he offers the most complete portrait possible of this fascinating dinosaur’s appearance, biology, and behavior. Acrocanthosaurus—similar in size to its later cousin Tyrannosaurus rex, but studded with large spines—roamed what is now the south-central United States 110 to 115 million years ago, during the Early Cretaceous. Carpenter worked on the most complete of the Acrocanthosaurus skeletons (nicknamed “Fran”) that has been found. Here he describes the techniques that tell us about Acro’s biological makeup, movements, and habits. Studies of joints reveal the range of possible motion, while bumps, ridges, and scars on the bones show where muscles, ligaments, and tendons attached. CT scans allow us to peer into the braincase, while microscopes afford a cross-sectional view of bones. These findings in turn offer an idea of how Acro stalked and ate its prey. Scientific evidence beyond the fossils provides avenues for further inquiry: What does the sedimentary rock encasing Fran’s bones tell us about Acro’s environment? What does our knowledge of Acro’s distant relatives, such as crocodilians and birds, imply about its heart and other soft tissues? Can our understanding of other animals explain Acro’s huge spines? Carpenter distills all this information into a clear, accessible, engaging account that will appeal to general readers and scholars alike. As the first book-length work on Acrocanthosaurus, this volume introduces a prehistoric giant that once stalked Texas and Oklahoma and offers a rare, firsthand glimpse into the trials and triumphs of paleontology. This version concentrates more on the historical aspect of the story, and has a unique chapter on Oklahoma and Southeastern Oklahoma history. In the Spring of 1983, a local naturalist named Cephis Hall dug up a huge dinosaur bone near the edge of the Mountain Fork River on land owned by a major multi-national corporation. The discovery set him off on an epic quest to excavate and recover a rare and valuable dinosaur specimen. But major roadblocks stood in his way. Hall had always dreamed of making a major dinosaur discovery and now the opportunity of a lifetime was staring him in the face as the corporation overshadowed the excavation. He and his partner, Sid Love, would have to battle the corporation, academia, the Oklahoma State Legislature, and the legal system for ownership and control of the world-class specimen. It was a bitter struggle to the very end. The real story begins after their excavation and recovery of the articulated skeleton, which took them almost four years to dig out of a polluted waste holding pit. The dinosaur would ultimately fetch the second highest price ever paid for a dinosaur specimen. It was as big and fierce as T.rex, but 50 million years older and much rarer. The author has blended history, science, politics, and controversy into an amazing and heroic account of two men's real life adventures and impossible struggles against overwhelming odds. Their story represents one of the greatest achievements of paleontological history. The most amazing thing about their story is that it is true. This book contains unique regional history about the ethnic and cultural heritage of Southeastern Oklahoma. If you favor the underdog you should buy this book. The Bone War of McCurtain County is a true adventure story about two rustic naturalists, Cephis Hall and Sid Love, who discovered and excavated a world-class dinosaur and found themselves mired in controversy and strife. After recovering one of the rarest, most valuable specimens in history, the two men became embroiled in a titanic struggle over ownership rights with the landowner, a major timber corporation, and its friends in government and academia.The conflict was so intense and personal that the author has elected to call it a war - a bone war. Although Cephis and Sid had found their share of valuable treasures, the grand prize had long eluded them.Their dream was to discover and extricate a rare and valuable dinosaurian fossil and make their mark on the scientific world. They were not credentialed scientists, but rather intrepid explorers of nature. The problem was that their dream was unauthorized and didn't fit neatly into the status quo. After securing permission from the corporation, the two men dug for four years and recovered the remains of a very rare and elusive theropod dinosaur (the Acrocanthosaurus) worth millions if it could be saved. As apex predator of North America during the early Cretaceous Period (about 115 million years ago), it was approximate in size and ferocity to the mighty T-rex, but lived some 50-million years earlier. It hunted and feasted on giant sauropods weighing as much as 100 tons. The corporation didn't take the two men seriously and considered them incapable of finding, let alone excavating, anything of scientific significance. But Hall and Love would prove them wrong. The two men had bought into a tenuous version of the American Dream that was poised to "reap the whirlwind." Their ambition brought them to the brim of abyss and cataclysm. Powerful people and institutions stood in the way of their ambition. But a dream and will to pursue it can result in war. In today's world, there are few animals that weigh in at a ton or more. But millions of years ago, massive creatures roamed the earth. This fascinating and educational coloring book focuses on the bigger, taller, and heavier mega dinosaurs that scientists are constantly bringing to light. Along with recently discovered species, it features old favorites like the mighty Tyrannosaurus rex. Each of the 44 illustrations includes descriptive captions plus a small silhouetted image of the dinosaur that compares its size to that of a human being. This is a shorter, storyline version of the book "Acrocanthosaurus - The Bones of Contention" and concentrates more on the storyline than the history or science aspects, although it does contain considerable science and history content. In the 1880s, during America's first Gilded Age, two eccentric and aristocratic scientists, Othniel Marsh and Edward Drinker Cope, engaged in an anomalous, competitive trek to outdo each other in a paleontological contest of numbers - a bone war. This war, fought in the vast panorama of the American West, was an invidious contest of egos and wills to decide who could recover, identify, and document the most prehistoric fossils from an unrecorded past. This competition spurred the greatest spree of fossil discoveries in history, at least until America entered a second Guided Age one-hundred years later in the 1980s, as new technologies and finances propelled another round of bounteous fossil discoveries. During this second American Gilded Period, an improbable bone war in provincial southeastern Oklahoma was fought over ownership rights to one of the single greatest fossil discoveries of the century, indeed, of all history. 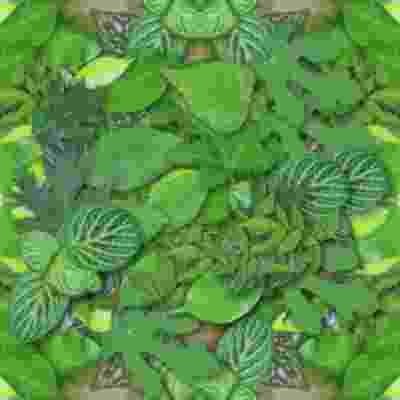 This war was fought between two local naturalists against entrenched paragons of institutional dominance - a giant corporation, two major universities and cloistered academics, the state legislature, and a wealthy fossil tycoon. Cephis Hall, an Arkansas hillbilly, and Sid Love, a Choctaw Indian, dug their prize from a corporate waste-holding pit near the edge of the Mountain Fork River. The discovery set in motion a chain of events that would alter their lives forever as they embarked upon an epic journey and conflict against mighty foes in a David versus Goliath scenario. Cephis Hall and Sid Love faced a whirlwind of controversy as they found themselves at the crossroads of science, politics, and religion. Powerful people and institutions wanted to confiscate their treasure. A tale of mystery, adventure, and nature - Indiana Jones southern style. Buried treasure, dinosaurs, greed, corruption, moonshine, pot fields, quartz crystals, and an unauthorized version of the American Dream. This amazing true story is stranger than fiction. The book narrates the true story of Arkansas hillbilly Cephis Hall and Choctaw Indian Sid Love, two backwoods naturalists who sought buried treasure and nature's booty in the American South. Their troubles began after they discovered and excavated a world-class dinosaur specimen on land owned by a major timber corporation, which propelled them into a drawn out conflict with the company and its friends in government and academia. The book tries to come to grips with the daunting question: What does it mean for two normal citizens to battle a powerful corporation, two elite universities and renowed scientists, a state legislature and prominent politicians, and all the attendant infrastructure set up to sustain them? A dramatic portrayal of the underdog against centers of institutional power. All the Schleich figures are lovingly hand-painted with detailed modelling and allow kids to learn while they play. The Acrocanthosaurus was around the same size and weight as the Tyrannosaurus Rex and Giganotosaurus. Unlike many other dinosaurs, it had seven openings in its skull rather than five. It also had lots of neural spines on its neck, back and tail, which probably formed a small “sail”. 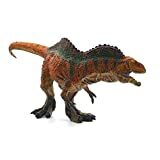 Beautiful Acrocanthosaurus Atokensis dinosaur figure. Beware! 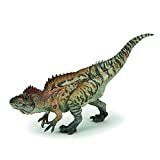 This high quality, realistic looking Acrocanthosaurus is on the prowl looking for prey, which it holds between its large jaws and grabs with its forelimbs. See the row of tall neural spines, located on the vertebrae of the neck, back, hips and upper tail, which is its most distinctive feature. 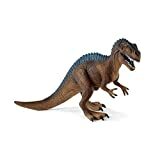 Terra by Battat Dinosaurs have been designed by enthusiast’s hero, Dan LoRusso, and make perfect gifts as toys or collectibles. Packaging includes educational information about the dinosaur. The Wild Safari Wildlife series was designed for the hands of the smaller child. We take pride in the quality, innovation and design that have characterized our products for over 3 generations. Explore life 110 million years ago alongside the largest dinosaur of its time. The Wild Safari Dino collection has all the favorites including the Tyrannosaurus rex, Triceratops, Brachiosaurus and many more. 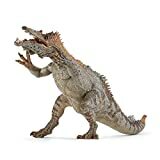 Dinosaurs that children love most in a variety of fiercely action packed poses. 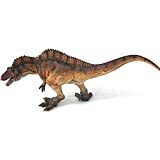 Each dinosaur replica is amazingly detailed, hand painted for realism and designed to stimulate the imagination. All our figures are sculpted by experts which ensures authenticity. By providing educational information in five languages, we encourage children to learn about these ancient extinct creatures that once roamed our earth. Acrocanthosaurus existed in North America during the Aptian and early Albian stages of the Early Cretaceous.Fossil remains are found mainly in the U.S. states of Oklahoma, Texas, and Wyoming.Acrocanthosaurus was a bipedal predator. As the name suggests, it is best known for the high neural spines on many of its vertebrae, which most likely supported a ridge of muscle over the animal's neck, back and hips.Acrocanthosaurus was the largest theropod in its ecosystem and likely an apex predator which preyed on sauropods, ornithopods, and ankylosaurs. ✔ HIGH QUALITY: Made of Environmentally Friendly Plastics, Safe Non-Toxic. 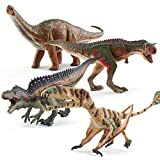 ✔ HAND-PAINTING: Multiple Complicated Forming Process, Hand-Painting, Make Up a Most Realistic Dinosaur Form. 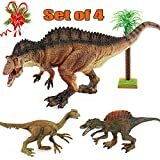 ✔ BIG SIZE: Dinosaurs About 11 x 5 Inch. These Big Dinosaurs Model Made of Environmentally Friendly Plastics, Safe Non-Toxic. They have Rich Details. Sharp Teeth, Vicious Eyes, Curly Tail, Hard Scales. Multiple Complicated Forming Process, Hand-Painting, Make Up a Most Realistic Dinosaur Form. Not Only Used as a Nice Toy for Children's Festival & Birthday Gifts, But Aslo be a Ornaments for Home, Office or Other Place. Due to Shooting Light Difference, The Actual Model May Have A Bit Different from The Picture Color Shown in Website.